Global Organic Spice Market size is estimated to exceed USD 40 billion by 2024; according to a new research report by Global Market Insights, Inc. Rising awareness among consumers regarding the medicinal properties and health advantages of natural spices consumption will primarily drive the industry growth. Shifting preference towards chemical free ingredients owing to their notable health benefits including anti-inflammation and pain-relieving properties is expected to propel the organic spice market growth. The increasing preference for international cuisines and gourmet products have enhanced the natural ingredients demand particularly for flavoring applications. Since the product is usually sold at premium prices, its demand can boost the export revenue in the countries with its high production over the coming years. However, higher price trend and low shelf life may hamper the organic spice market growth. The industry has witnessed huge investments from the government as well as private investors that paves opportunistic ways for the market participants to increase profitability. Various countries are making various efforts to increase the consumption of naturally grown food by expanding land for its cultivation and enabling favorable regulations. Garlic is expected to showcase dominance in organic spice market, generating more than 2.5 million tons by 2024. High revenue generation is attributed to rising demand for flavoring agents in numerous domestic and international dishes across the globe. Proliferating demand for various applications such as culinary, RTE and savory foods will further support the industry dominance. Ginger will exhibit over 6% CAGR from 2018 to 2024 owing to its high usage in processed food industry. High consumer preference due to its indigenous medicinal properties coupled with high rising demand from numerous variants including ginger bread and premium sauces will drive the organic spice market growth. Culinary contributed for dominating share accounting for over 30% of the organic spice market in 2017. Regular usage of ingredients including garlic, ginger, coriander, and chilli for preparing numerous cuisines along with their benefits will contribute significantly towards the revenue generation. Snacks and convenience foods will witness notable gains in forecast period owing to their rising consumption, especially among millennials across the globe. 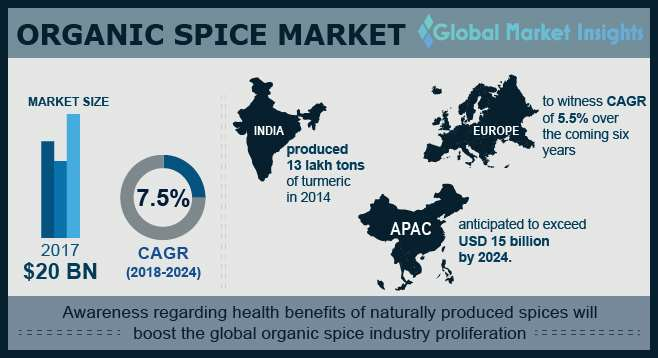 Asia Pacific organic spice market is expected to value more than USD 15 billion by 2024. Substantial production across the region, particularly in Vietnam, India, and China will support the industry demand. The region witnesses presence of established and high-yielding agricultural practices, that result in high quality products, further driving the industry growth. Europe will exhibit growth over 5.5% from 2018 to 2024 owing to rising production across the region owing to the increasing consumer preference towards the product. The competitors continuously focus on engaging in R&D and implementing strong promotional events to spread alertness among the consumers. Some key participants in the industry include Sapthsathi Agriculture Project, Earthen delight, Organic Spices, Rapid Organic, Frontier Natural Products, Plantrich and Yogi Botanicals Private Limited. They are focused on producing premium quality products by using modern technologies. This helps in retaining the quality of the product and food safety standards.